Ukrainian naval ships, which were recently seized by Russia's FSB security service, are seen anchored in a port in Kerch, Crimea, Nov. 28, 2018. Ukrainian President Petro Poroshenko is asking NATO allies to send naval ships to the Sea of Azov to aid his country and "provide security" amid tensions with Russia. Poroshenko's comments were published Thursday in the German newspaper Bild. NATO spokeswoman Oana Lungescu responded to Poroshenko’s request by saying the military alliance already has a strong presence in the Black Sea region. She said NATO ships routinely patrol the area and several NATO allies conduct reconnaissance flights over the region. “We will continue to assess our presence in the region,” Lungescu added. Also Thursday, Turkish President Recep Tayyip Erdogan said he could play a mediator role between Ukraine and Russia. He has held phone talks with leaders on both sides, and said he would continue discussing the issue with Russian President Vladimir Putin and U.S. President Donald Trump at a G-20 summit in Argentina. Kremlin spokesman Dmitry Peskov said Putin and Trump will have their own meeting Saturday to discuss relations between the two countries as well as regional conflicts and disarmament issues. Russian forces seized three Ukrainian vessels and their crews Sunday as they tried to make their way through the Kerch Strait to the Ukrainian port of Mariupol, in the Sea of Azov. 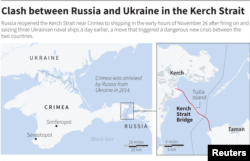 Ukraine said Russia used a tanker to block access to the Kerch Strait, which under a treaty is shared territory. Russia said the vessels illegally entered its waters. Putin on Wednesday blamed Poroshenko for the incident, alleging it is an attempt by Poroshenko to boost his re-election chances next year. Ukraine has imposed martial law in some of its border regions in response to the incident, and with a growing number of other European countries, urged Western allies to impose additional sanctions on Moscow. Poroshenko said martial law will help "strengthen Ukraine's defense capabilities amid increasing aggression and according to international law, a cold act of aggression by the Russian Federation." He demanded Russia release the Ukrainian sailors and vessels. Volker said the Ukrainian vessels were returning to Odessa "when the Russian vessels then pursued them and attacked them." Volker said he has not received independent U.S. verification of Ukraine's information, but believed "the data the Ukrainians have provided is quite clear." Poroshenko wrote on Twitter Thursday his country will impose unspecified restrictions on Russian citizens in response to Russia’s actions. Ukraine has already denied Russians entry into the country since last week’s incident.